After posting photographs of butterflies last week, I decided to take a deeper look into the relationships between ants and blue butterflies. There’s been a lot of new discoveries in this area over the last decade or so. Butterflies of the family Lycaenidae, commonly referred to as blues, hairstreaks and coppers, have been known to have a variety of fascinating relationships with ants. Most caterpillars of lycaenid butterflies feed on leaves, flowers and seeds of their host plants. They also have specialized glands that make a sweet liquid. 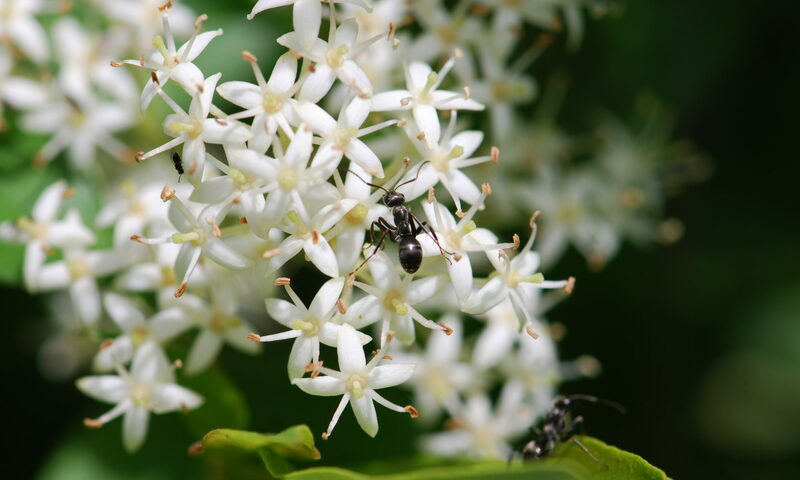 The ants are attracted to the glands and feed on the secretions just like they do with the honeydew of aphids or scale insects. In return the ants protect the caterpillars, or at least as best they can. 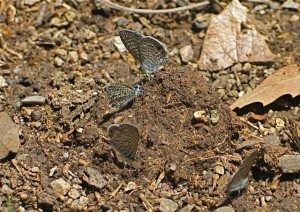 For example, the endangered Karner blue butterfly, Lycaeides melissa, caterpillars feed on lupines. The caterpillars have three glands that produce a mixture of carbohydrates and amino acids. Eleven species of ants have been recorded visiting the caterpillars, and larvae tended by ants have been shown to have higher survival, presumably due to lower predation. In New South Wales, Australia, the very rare Bathurst copper (Paralucia spinifera) caterpillars also produce sweet rewards for the ants. In exchange, the ants take extra good care of them. The ants are like goatherds, keeping the caterpillars like miniature goats. At night the ants herd the caterpillars up into the bushes where the caterpillars feed on the plants. In the morning the ants herd them back down into the ants’ nest where the caterpillars rest for the day. The next night, out they go again. In fact, if someone starts to disturb the caterpillars while they are out feeding, half the ants attack the intruder while the rest round up the caterpillars and head them back down to the nest. Imperial blue butterfly caterpillars (Jalmenus evagoras) of Australia have been found to “call’ to their ant attendants by stridulating. Researchers have found that the larvae produce three different types of calls. Both the larvae and the pupae have single-celled glands over their bodies that produce attractants. In this case the ants guard both the larvae and the pupae of the butterfly. In this video you can see the glands of the caterpillar. A few caterpillars have even more glands that release substances to appease and fool the ants even more. The caterpillar of a dainty alcon blue butterfly (Maculinea alcon) from Denmark uses its glands to fool foraging worker ants into taking it back to their nest. Once inside, the caterpillar kills and eats ant larvae while the guard ants rest calmly nearby. In fact the ants actually mistake the pink-colored caterpillar for one of their own larvae, and give it food and care. Eventually the caterpillar transforms into a pupa, but still remains underground under the protection of the ants. Only once it emerges as an adult butterfly do the ants recognize it as an enemy and attack it, so the butterfly must quickly exit the anthill before it is discovered. Finally, the Rebel’s large blue, Maculinea rebeli, has taken deception to the maximum. The larvae have recently been shown to mimic the sounds produced by the queen ants of their hosts to elicit food, care and even rescues, at the expense of the colony’s own offspring. Go to “Caterpillar noise tricks ants into service” article at Science News to actually hear the sounds the caterpillars and ants make. Now, that’s interesting. Darlyne A. Murawski. (2003). Killer caterpillars: built to eat flesh. National Geographic. June. pp. 100-111. Vol. 323. no. 5915, pp. 782 – 785. Science. 1 June 1990: Vol. 248. no. 4959, pp. 1104 – 1106. In this book, Chapter 18 has extensive information about the Imperial blue.